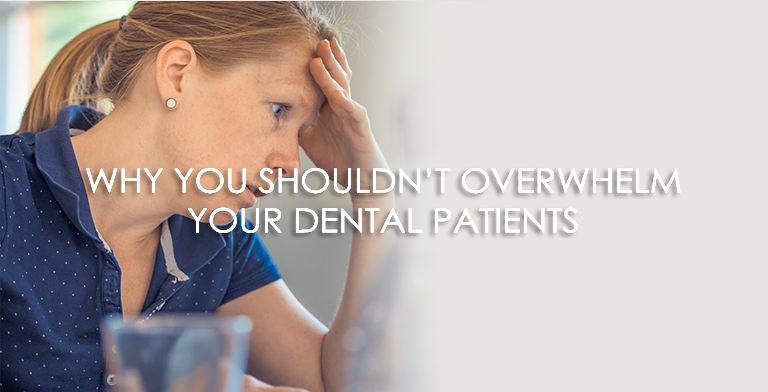 The fact is most patients don’t go to you because they just want to know if their teeth are still healthy. Most of the time, it’s because there’s a problem. Some people feel skeptical, anxious and even a bit afraid, especially if it’s their first time having dental problems. What you should do is talk to them to learn what their problem is and learn about their general health. Then, enthusiastically put together a dental plan and detail everything about their case. Be patient with them because this is a huge reason why your clients don’t comeback. They don’t want to be bombarded with so many decisions and information all at once because you will practically overwhelm them. We know exams should be thorough and direct to the point but be tactful enough to understand what your patient needs right now. There are reasons why overwhelming your clients can affect your business as a whole. They say that trust isn’t given but earned. The patients should warm up to you and feel at ease that they’re safe in your hands. The fact that you started off listing expansive and expensive dental plans will come off that you’re not there to really help them but to make money from them. You should opt to start small plans and build their image of you. Every small successful procedure equals to giving patients more confidence in your skills. This will make them consider you more for their other future dental concerns. A lot of medical practitioners tend to forget that their field is more than just a business venture especially when most during their education years are forced to memorize and understand the Hippocratic Oath or the “Do No Harm” Principle. Harm is not just about simply treating physical pain but all types of pain. This is why medical practice should always consider the holistic approach or alleviating every problem and concern of a patient while improving their general well-being. This means that you should be mindful enough to engage with your patients. You shouldn’t just present a lot of treatment plans or options. You should focus more on the problem at hand and nothing else yet. You should show that you want them to be at their best health and that’ll leave and impression that you want their best interest at heart. This will ultimately earn their trust and possibly create a loyal client for the future.